Good things come to those who wait, especially when it comes to meat that has been aged. Grilling aged meat delivers a big payoff of enhanced flavor and tenderness. Although typically pricier than fresh-cut meat, buying and cooking aged meat can significantly up your grill game. While it is theoretically possible to go the do-it- yourself route of aging meat at home, it involves using large, fat-capped sections of meat and dry aging in open air. It isn’t practical for most home cooks. 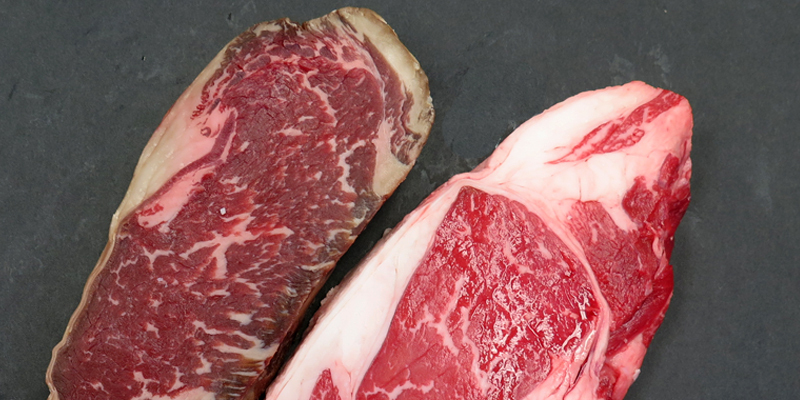 Attempting to dry age individual cuts, such as a strip steak, often leads to spoilage or degrees of dehydration that render a small yield for an expensive cut. It’s best to buy aged meat from a trusted source. Before you buy aged meat, let’s dive into the basics of why and how we age meat. Aging allows enzymes to partially break down muscle tissue in the meat so it becomes more tender. Chicken may be aged a few days. Pork and lamb cuts may benefit from aging up to a week. Beef cuts are typically aged for up to a month. Roughly the first two weeks of aging is where the beef will increase its tenderness, after that it’s more about developing flavor. Beef is the most commonly aged meat; pork cuts like ham are cured in a somewhat different process. This method is a centuries-old practice used to preserve meat so it doesn’t spoil. The dry- aging process darkens the color of the meat as blood in the muscle oxidizes when exposed to air. Darkened meat doesn’t mean it has spoiled. Dry aging allows the meat to develop a complex, nutty flavor. Dry aging has two connected downsides: moisture loss and decreased yield. Moisture is extracted from the meat, which reduces the overall volume. Once aged, the meat’s surface may need to be trimmed, resulting in further loss of volume. Your butcher will usually trim the steak in advance of you buying it. You can cook dry-aged meat just like its non-aged counterpart on the grill. But remember the meat has lost much of its internal moisture and weight during the aging process. It should take less time to cook to the desired doneness. Apply moisture by brushing on olive oil or melted butter while grilling to prevent the meat from completely drying out as you cook. This more recently developed technique relies on refrigeration and vacuum-sealed plastic. Wet-aged meat at the market has been vacuum-sealed so there is no contact with air. The meat ages in its blood, natural juices, and sometimes marinade. This aging method may impart a metallic or sour note to the meat. As a bonus, there’s no weight loss due to dehydration. Wet-aged meat is more readily available than dry-aged versions. Before cooking, drain external juices from the package. Season the meat and grill or pan-sear as you normally would. Enjoy with a savory sauce, to balance out the tangy elements in the steak, once served at the table. A dry or wet aged steak will taste noticeably different than a steak that hasn’t been aged. Over time, you’ll be able to notice those differences just as you might with grass versus grain fed beef. This is a case where you need to trust your own palate and do a lot of steak eating.